Former Cumberland City Councilwoman Nicole Alt-Myers, a Republican candidate for state delegate in District 1C, violated Milestone Garden Apartments’ policy on soliciting apartment residents, according to a Milestone Garden Apartments employee. 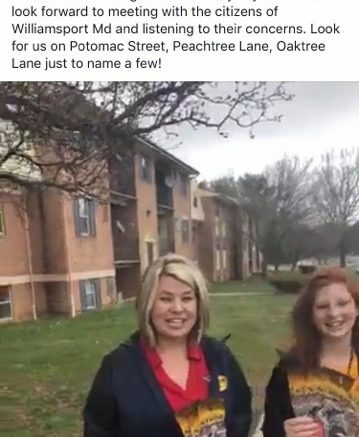 Alt-Myers, the spouse of embattled Washington County Commissioner LeRoy E. Myers, Jr., on Good Friday, March 30, posted a video on her Facebook campaign page, Citizens for Nicole Alt-Myers, at 12:47 p.m., standing adjacent to the Milestone Garden Apartments in Williamsport, Md., announcing that she and her team – her daughter and her daughter’s friend – would be door knocking in Williamsport on that day. However, two Milestone Garden Apartments tenants contacted A Miner Detail on Friday evening and Saturday morning to complain about Alt-Myers soliciting their apartment complex with candidate flyers. “Mrs. Myers should have first contacted the main office before handing out her flyers. Political candidates are not usually welcome here,” one apartment tenant told A Miner Detail who did not wish to provide her name. A Miner Detail on Monday contacted the Milestone Garden Apartments business office to confirm their policy on door-to-door campaigning and soliciting. The business office employee told A Miner Detail that Milestone Garden Apartments “does not condone” candidate solicitations and encouraged residents who were affected to post “No Soliciting” signs near their front doors to reinforce the policy in place. The employee said that Alt-Myers did not contact the apartment complex in advance before leaving her campaign flyers inside the apartment complex. “Her campaigning can wait, and I wouldn’t vote for her anyway for being disrespectful,” said the elderly resident. The holiday is observed during Holy Week as part of the Paschal Triduum on the Friday preceding Easter Sunday and may coincide with the Jewish observance of Passover. Alt-Myers faces off against incumbent Republican Del. Mike McKay (R-Cumberland) and Hancock attorney Jordan Lysczek in the June 26th Republican primary. No Democrat has filed to run in the district.